Build your skills with a free Crude By Rail and Flammable Liquids Training for municipal first responders in 2019. 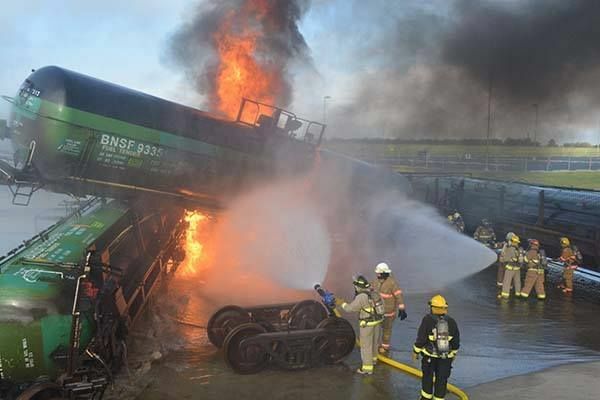 BNSF Railway will offer Crude By Rail / Flammable Liquids Training workshops to municipal first responders in 2019. This no cost training program will provide first responders with the basic knowledge, skill and abilities to respond to incidents involving Crude By Rail (CBR). The program is delivered over 3 days (24 hours) with over 60% of the time spent on field exercises. The field training evolutions will include a demonstration of crude oil fires, boil overs and application of foam to crude oil incidents, as well as advanced fire fighting techniques. The evaluation will culminate in a full-scale derailment exercise. No cost to attendees for travel expenses – air, rental car and hotel are prepaid. Items such as airline baggage fees, evening meals, rental car gasoline and home airport travel mileage expense (if applicable) will be reimbursed through a prepaid Visa card.